I am interested in hiring a limo but am not sure when or which type. Can you advise me? Which type of limousine you hire depends on how much you want to spend, how many people there will be in your party and what you would be needing your limo for. We have the Lincoln town car limousine which would be the standard type seen most often, which carries 8 people. After that we are moving up to the big 4x4 limos which can carry 16 passengers. Lincoln town car limousines are mostly used for weddings, christenings and small party groups, while the 4x4s such as the Hummer limos are mostly used for big parties. The price between easy is mostly the same per person but sometimes you will find its more expensive per person to hire a 4x4 limo. You will occasionally get a 12 or 14 seater limo depending which are your in. What cars can you offer? We have a wide selection of limos which start from the Lincoln town car limousines which hold 8 people then moving up to cars such as the BMX and Porsche Limousines which carry up to 12 people. The next ones up are the 4x4 limos which include the amazing Hummer limo and its counterparts the Ford Excursion and the Lincoln navigator limousines. These massive 4x4 monsters can carry up to 16 people. There are also other rare cars such as the hemi Chrysler 300 which is only available in certain parts of the country. Hire Hummer Limo is a National limousine hire agent, we have hundreds of limo operators all over the country with a vast fleet so don’t have a problem quoting you if you are in the UK. 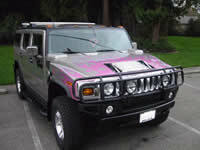 The selections of limos differ in each area as we can only work with the cars our operators have available. We are always on the look out to work with new operators but we do reserve the right to only work with our selected limousine operators, as we don’t charge anything for this service. Limousine hire can be expensive but we do our best to find luxury limousine hire at prices that can be afforded. There are a lot less quotes for limousines than there are limo operators so you will find the price of limo hire can range dramatically depending on how many enquires the limo operators get. You will find a limo company that doesn’t get a lot of enquires will go out a lot cheaper than a limo company that is inundated with calls. We strive to find the best there is for as cheap as we can! What do people use limousines for? People use limousines for a number of different types of things the most common uses for limousines would be for weddings, stag nights, hen parties, an anniversary, birthdays, proms, work parties or if you're just looking for a little something extra to spice up your night out. Pink limos are very popular for hen nights, Lincoln town cars are popular for wedding and big 4x4 limos are good for big parties. A limo is a great excuse just to have a bit of fun! Do you offer executive cars? Yes, we can supply executive cars for weddings or for smaller numbers of passengers. Our operators' fleets include Rolls Royces, Bentleys, Audis and other top spec executive cars.